We’re holding Season Ticket prices at 2018/19 levels until 30th April to allow you to lock in that guaranteed lowest price. 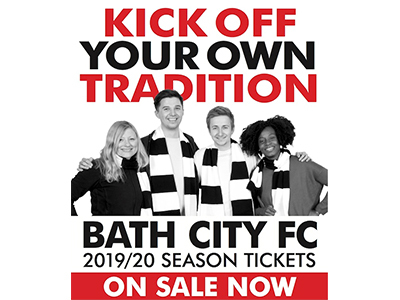 We haven’t set 2019/20 matchday entry prices yet but, whatever the case, if you buy now you’ll pay an average of just £10.48 per match (adult). Season Tickets will not be available to buy at lower prices at any time. Order yours now and secure your saving of up to £53 – that’s four FREE matches (and a KitKat). PLUS – every order before 30th April gets FIVE free drinks vouchers and a £5 Club Shop voucher. 2018/19 has already been a fantastic season with the team in the play-off chase all the way and crowds averaging over 1,000 – and you, the fans, have been a massive part of that. So please help keep the momentum up by signing up now and being part of the 2019/20 adventure! Buy online now or call 01225 423087 (10am-3.30pm) or buy at the Club Shop.